Fresh homemade sauerkraut is a delicious side that goes well with any meal. Not only is it easy to make, but it is also a good economic source of beneficial bacteria for your gut. In our family, sauerkraut has always been a long-standing staple for many generations. As I was growing up, I always enjoyed helping to make a large fifty gallon crock of homemade sauerkraut. My happy memories include shredding head after head of cabbage, measuring salt, taking turns with my siblings to pound down the mixture with a baseball bat, waiting days and weeks until it fermented, and then finally opening the crock and removing the spoiled top layer to reveal a huge vat full of fermented goodness. How wonderful it smelled! Fermenting sauerkraut in a mason jar recaptures some of those early childhood memories, only on a smaller scale. Instead of a large crock and a baseball bat, I use a mason jar and a wooden spoon. But I still use my German grandmother’s clever trick of removing and saving the outer cabbage leaves to layer on top of the sauerkraut in the jar. Not only do the cabbage leaves protect the sauerkraut, but since the top layer must be discarded, none of the precious sauerkraut is wasted. 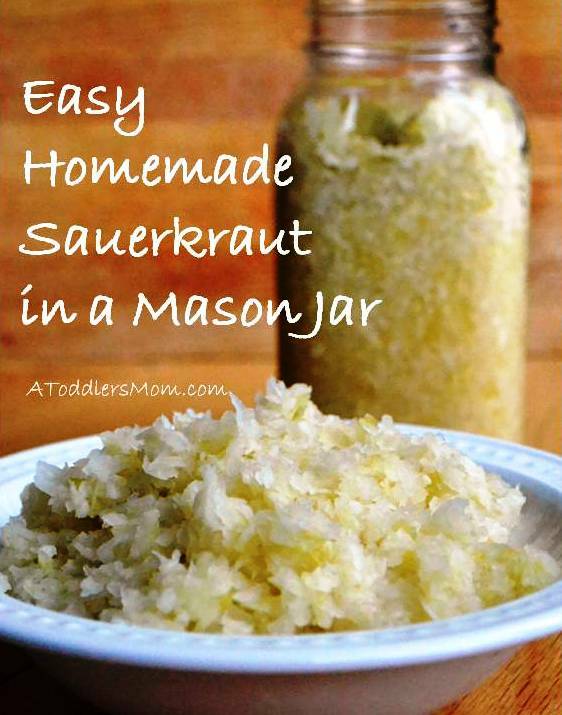 By making sauerkraut in a mason jar instead of in a crock, it is always fresh and delicious since there is no need to preserve it. Remove the outer leaves of the cabbage and set aside. Shred remaining cabbage and combine with salt. Knead with hands until cabbage is very juicy. Pack cabbage mixture into a mason jar with the handle of a wooden spoon until the cabbage is covered in its own juice. Leave about 1 inch of space at the top for expansion. Pack the outer cabbage leaves on top of the shredded cabbage and press down so that they are also submersed in the cabbage juice. Cover the entire jar with a tea towel and leave on the kitchen counter for one week. After a week, remove the tea towel and skim off any surface mold. Remove the large cabbage leaves and refrigerate the sauerkraut. Enjoy! Wow, so amaxing. Never realized it was so easy to make sauerkraut. So glad that you like the recipe!